Response Time issues? Here’s some advice on which tool to consider. The most common network tool; collates statistics such as utilisation and errors providing valuable info on how busy the network is - a green/red map for relatively low cost. SNMP reads counters in networking hardware - stats on what the device has seen pass through it. It does not read the data frames, so has no info on content. SNMP is a polling technology; data is updated on a regular basis, typically measured in minutes, taking data from two or more polls and giving you an average for that time period. SNMP can identify a sustained utilisation warning; picked up across at least two polls, however if the problem is not a utilisation issue the tool can’t offer more help. A new technology is now available at this layer using precisely spaced packet bursts it measures the efficiency of your WAN links; advising if the links are capable of providing the bandwidth you think they should. Modern routers are configured with many rules and it is increasingly common to find that although the link is rated at 10Mbs, it actually can’t push data out at that rate due to a lack of resources and the spare bandwidth you thought you had is not actually there. NetFlow (or the equivalent S, J, IPFix technologies) tools allow you to see who is using your bandwidth and the applications in use. Flow compatible routers or layer 3 switches can export data on what it has seen on a minute by minute basis including detail about the content of the traffic; the IP addresses conversing, the application port numbers and the interfaces on the routers they are passing through. NetFlow probes are also available which look at the raw data and export this summary information into a reporting engine - these are useful in getting visibility from smaller sites or areas with third party managed routers which typically won’t export any meaningful statistics. 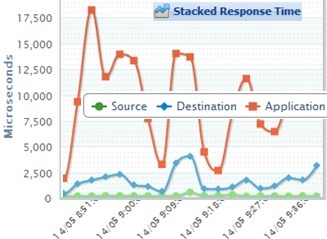 The NetFlow data contains no response time information and the exports are limited to 1 minute polling rates; therefore granularity is limited unless the response time issue is a link that is very busy for over a minute. Designed to test the availability of servers and applications take the tool directly to the area of slow response, use it to target all the local and remote servers you are interested in and run a series of tests to check they are responding in good time. There are up to 8 tests that can be run to a server, depending on what type of server it is. At the very beginning there is Ping but followed by HTTP, Telnet, Ping, SMTP, DNS …on so on. In general these tests are making sure the network gets to the server and the basic drivers on the servers are alive and kicking. The tools can be preprogramed, hence offer a Pass/Fail rating or in the case of the probes provide a longer term view of how stable the situation is by testing over a period of days or weeks. These tools struggle to pick up problems deeper in the application, but for many network people validation of network services is enough. Tools that utilize TCP which contains a lot of information about how data is being passed between devices. By measuring certain parts of the TCP process calculations can be made regarding the network and server response times. TCP is by far the most common transport mechanism for data in networks and there is a lot of good information that can be pulled from how fast TCP is moving the data around the network. Another advantage of looking at this layer is that you don’t have to store lots of information about the content of the frames (just the headers), so it’s easier to save data for historical reports about what’s going on. This is the first technology in this list where actual live traffic is being measured and the results have a direct relationship to the end user experience. Remember to consider that different applications use TCP in different ways hence some careful interpretation is still required. Generically packet capture solutions contain the answers to almost all response time issues. The problem has always been the amount of time and effort it takes to work out the results. Most capture solutions have been working hard on the way the information is displayed to make answers more accessible; generally the more you spend the better these reports tend to be. Traditionally packet capture solutions on laptops were plugged in after the event hoping to pick up some evidence of what happened. The modern take is to have packet captures running all the time, stored in large disk arrays - recover the captured packets that represent your issues from the stored data once an issue is highlighted and then do your analysis. These solutions hold the most amount of data about response time issues, with both the TCP and data content layers available to analyse the issues. These tools do need large amounts of storage to be effective (measured in TBytes) and require higher levels of skill sets from the operators. Part of the problem with looking at response time issues is that “response time” means different things to different people. For many people just being able to answer “the network is 20% busy, can’t be us” is enough and SNMP solutions can do that. For others, the answer needs to be more related to the servers actions and this means either sending them some generic data to reply to (AppNeta and OneTouch), or actually measuring the packets as they fly around the network (XG, Observer) in increasing levels of detail. The final element that separates out the solutions you are interested in is the price …………… for that please call!